ASU Sun Devil Football coach Todd Graham and Penni Graham. Football season: one of the most prominent times of the school year for many ASU students. But what does Sun Devil game day entail for those who actually make it happen? There is one role that often goes unnoticed, but could possibly have the biggest impact when it comes to supporting the team and taking care of staff. For Graham, the game day schedule is put together once all things are taken into consideration, such as uniform colors, official visitors and guests, tickets for family and friends, the channel the game is being broadcasted on and who is announcing, etc. After all of the logistics have been taken care of before hand, Graham makes treats to hand out to the security and media staff before the game. Graham takes a new group of people, usually family or friends, down to the field for the pre-game festivities which include a band performance and the team running out of the tunnel — all accompanied by fireworks. Graham enjoys the game from the football family section, located in between the student section. According to her, it is the best seat in the house. Although, Graham is not sitting down much during the game. She stands in front of the television to watch the play on the field, then watch the replay. “Then when there are only a couple minutes left in the game, I will go down on the field and to hug coaches, players and staff," Graham says. "After Todd [Graham] finishes his media obligations, we sit down with ribs and wings to watch film. I love reviewing the stats." But Graham was not exposed to only Sun Devil game days. Although Graham was born a football fan, her first college football game was at West Virginia University, where Todd Graham held his first Division I coaching position. “I met Todd when we were working at Allen ISD in Texas, he was the football coach and athletic director and I was the Director of IT and Curriculum. I thought he was pretty darn cute,” Graham says. Out of all the Division I schools Graham has supported her husband at, including West Virginia University, the University of Tulsa, Rice University and the University of Pittsburgh, she says that Sun Devil Nation is the best. One of the many traditions Graham enjoys is bringing Lil’ Sparky to the games. In addition, Senior day always holds a special place in her heart. Even as the seniors graduate, Graham says she believes that the future of the program is looking up. With the many new changes that will be implemented in the years to come, she expresses her continuous excitement and support. 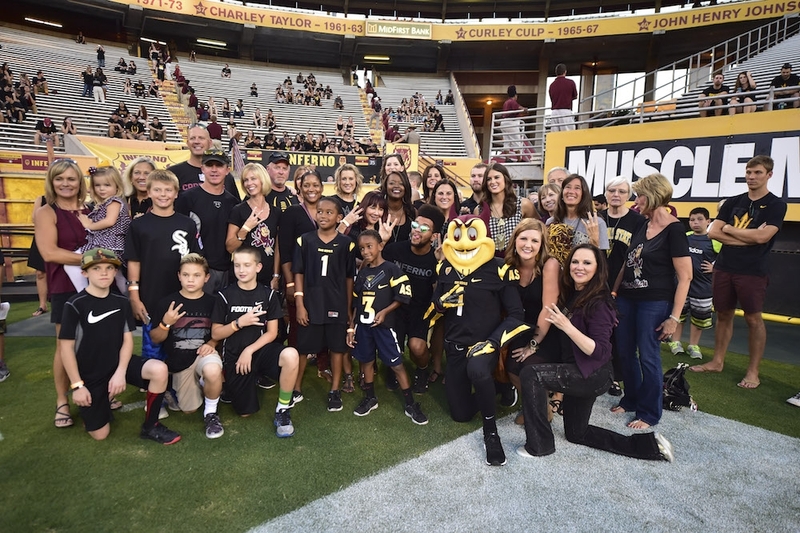 Graham’s continuous support of her husband and the Sun Devil football program may not always shine in front of the cameras on the big screen, but her positivity has spread to many throughout the entire program. “In the future, I see Sun Devil football as the best in the nation on and off the field, representing Arizona State with its exceptional character, toughness and intelligence,” Graham says.